Austria, 1920-21: The government printed money to cover its debts from World War I. Food and fuel costs exploded. Banks urged their customers to convert Austrian kronen into a more stable currency… even though it was against the law. We’ve recounted the tale before. We tell it again now for two reasons. First as a reminder that most of the imbalances that caused the Panic of 2008 remain woefully out of balance. But you already knew that. There’s extra urgency to our telling now: The one “X factor” the pundit class touts as the U.S. dollar’s savior? It might prove the dollar’s final undoing. Bank runs, capital controls, an effective default on the national debt — and all because of the “prosperity” we’re enjoying now. Our suspicions were first raised in January… when two “opposing” politicos held hands and sang in sweet harmony about America’s energy boom. Not that we disagree: It all sounds very familiar if you were following the “Re-Made in America” thesis of our own Byron King more than two years ago. Then it was radical. Now it’s conventional wisdom. Leave it to us to throw a cat among the pigeons: For as much prosperity as the U.S. energy boom is creating now… it will ultimately set off the next major economic crisis. Indeed, it will tank the U.S. dollar’s status as the world’s “reserve currency” once and for all. The very thing helping to prop up the U.S. dollar now will ultimately kick out all those props and topple the greenback from its status as the world’s reserve currency. Not tomorrow or even next year. But the destination is set… and our arrival is certain. It won’t look exactly like Vienna in 1921… but it will feel just as awful. So strap in: Some of the ground we’re about to cover might sound like old hat to you… but we promise you’ve never seen the dots connected in this way before. 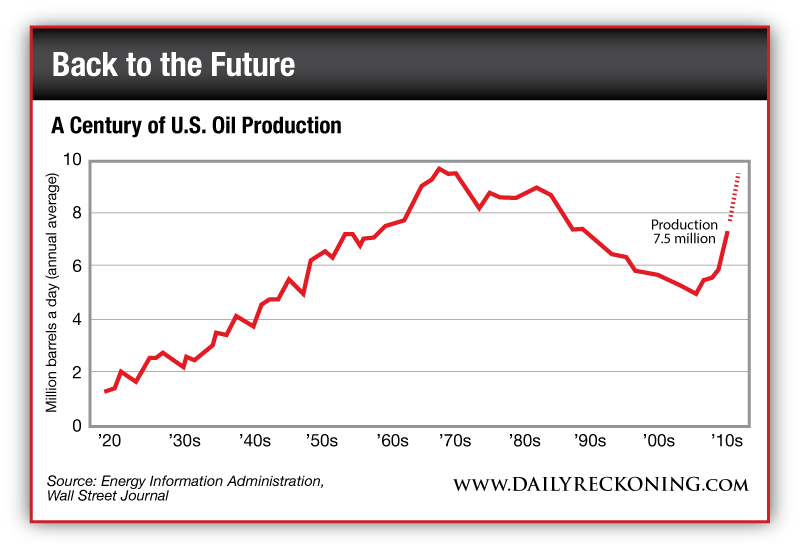 U.S. oil production averaged 7.5 million barrels per day during 2013. The increase over 2012 marked the biggest in U.S. history. Indeed, it’s the fourth-biggest annual increase by any country ever… and Saudi Arabia holds the top three spots. And it only gets better from here. The peak year for U.S. crude production was 1970 — a little shy of 10 million barrels per day. 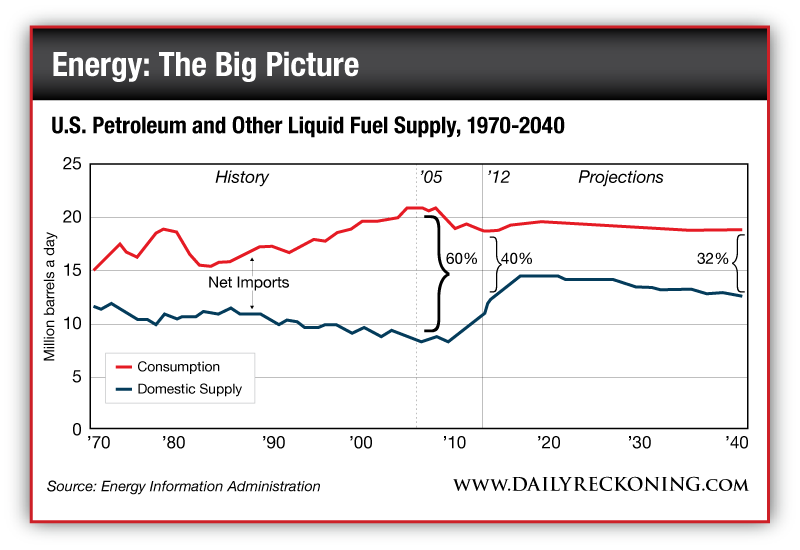 As you see from the “Back to the Future” chart, the U.S. Energy Department projects the nation will once again equal that number by 2019. In 2005 — only nine years ago — the United States imported 60% of its oil needs. By 2012, that number collapsed to 40%. Check out the chart nearby and you’ll see the percentage is set to shrink even more over the next quarter-century. And make a mental note — we’ll be coming back to this chart later. As we go to press, a barrel of oil fetches $100, give or take. So every 1 million barrels per day of new supply means $100 million less imported oil every year. Lower import costs, a lower trade deficit, fewer dollars flowing overseas — great news for the dollar, huh? It’s all good, right? Well, yes… except that now the entire structure that’s supported the global financial system for 40 years is starting to come unglued. The petrodollar arose from the ashes of the Bretton Woods system after President Nixon cut the dollar’s last tie to gold in 1971. In the immediate post-World War II years, Bretton Woods made the dollar the world’s reserve currency — the go-to currency for cross-border transactions. If you were a foreign government or central bank, the dollar was as good as gold — for every $35 you turned in to the U.S. Treasury, you received one ounce of gold. Chances are you know the rest of the story: Foreigners recognized Washington was printing too many dollars, the French wanted more gold than Washington was willing to give up and Nixon “closed the gold window.” But without gold, what would continue to cement the dollar’s position as the world’s reserve currency? After the “oil shock” of 1973–74, in which oil prices shot up from $3 a barrel to $12, Nixon’s Secretary of State Henry Kissinger got an idea and convinced the Saudi royal family to buy in. The deal went like this: Saudi Arabia would price oil in U.S. dollars and use its clout to get other OPEC nations to do the same. In return, the U.S. government agreed to protect Saudi Arabia and its allies against foreign invaders and domestic rebellions. The appeal for the House of Saud was obvious — the weight of the U.S. military would keep the family’s 7,000 princes living in the style to which they’d become accustomed. That lending supports the purchase of American goods — everything from Boeing airplanes to Archer Daniels Midland corn. Oh, and U.S. Treasury debt. Can’t forget that. P.S. Regardless of how or when the U.S. dollar eventually collapses, there will be solutions for you to protect your wealth and even profit in the process. In today’s Daily Reckoning email edition I gave readers a chance to discover two specific solutions to the coming dollar collapse, absolutely free. And that’s just one small benefit of being a reader of the FREE Daily Reckoning email edition… Every issue comes jam-packed full of great opportunities just like this. If you’re not getting it, you’re not getting the full story. Sign up for FREE, right here, and never miss out on your chance to get this kind of expert investment advice. 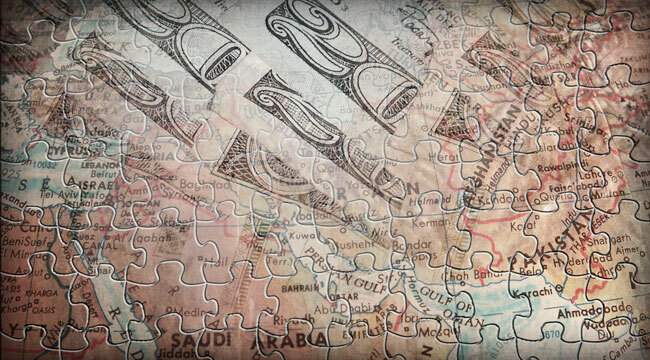 You can read Part II of this essay, right here: Prepare for the Death of the Petrodollar.